Summer physics is a wrap! As of just a little while ago, I finished up physics II, and what a relief it is. For the next two weeks, I get a real summer. I’ll be bouncing around and catching up on a lot of CR related work (if you’ve emailed me in the last four months, or if you’ve searched for a new-ish recipe only to find that my recipage and recipe tab are hopelessly out of date, then you know what I’m talking about), but I’ll also be reading, sleeping, and replenishing my energy for the coming fall. I’m excited. Yesterday, in preparation for my final, I planned to spend the entire day on campus studying and in class/lab. This meant two packed meals, rather than one (I’ve been packing breakfast all summer for my early class, but trying to dash home for a quick lunch). And this, in turn, meant limited room in my already crammed backpack. It carries two notebooks, a netbook, my gym clothes and sneakers, two chargers, my wallet, my phone, my pencil case, and my water bottle every single day: space is precious! I went ahead and asked you guys via twitter and facebook what your suggests were for a super light, portable breakfast. 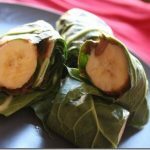 Top suggestions included banana and peanut butter, buckwheat cereal, green smoothies, chia pudding, fruit, and quinoa with banana or other fruit. Fruit was stricken from the list pretty quickly: I’d never make it through a long morning of class and lab on fruit alone! And while you all know my love of a good chia pudding, my issue with it is that it tends to get a little heavy, as do overnight oats! Ditto for packed smoothies. What isn’t heavy, however, is cooked quinoa. It’s light and fluffy as can be, and I realized that, if I purchased a banana on campus and came up with an easy sauce, I’d be set. The sauce part was a snap: here’s what I did. Optional add ins: ginger, cinnamon, cardamom, homemade chai spice mix, protein powder. 1. Mix almond butter sauce ingredients in a high speed blender till well mixed. Pack up a few tablespoons in a tiny tupperware container. 2. To assemble breakfast, slice banana and mix into quinoa. Top with sauce, and enjoy on the go! So there’s a small peek into my solutions for student dining! As someone who really loves big, voluminous, vegetable stuffed meals, I do find that campus dining is a challenge (and I miss the office fridge at my old job a lot). But I hope to be a student for a long time yet (and a person who works in hospitals after that), so I’ll need to adjust to eats on the go. Thanks to my Facebook friends for your inspiration (especially Rebecca, who was very enthusiastic about the quinoa option, and makes a similar one herself), and for your help! You all helped to remind me that eating whole, healthy, plant-based food on the go is possible. First of all, congrats on being done and getting to enjoy some of summer! I always have to pack breakfast and lunch for work, but they don’t have to be stuffed in a backpack (right now.) 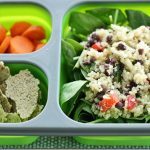 And while I never really liked quinoa simply because it was too light as opposed to rice or oats, I can see how that would make for a lighter mean–literally–for your bag. And seriously…nothing bad can come of almond butter and banana. You could put it on a shingle and it would be great. Yay, glad you liked it and that you are equally as enthusiastic as me about this winning combo. 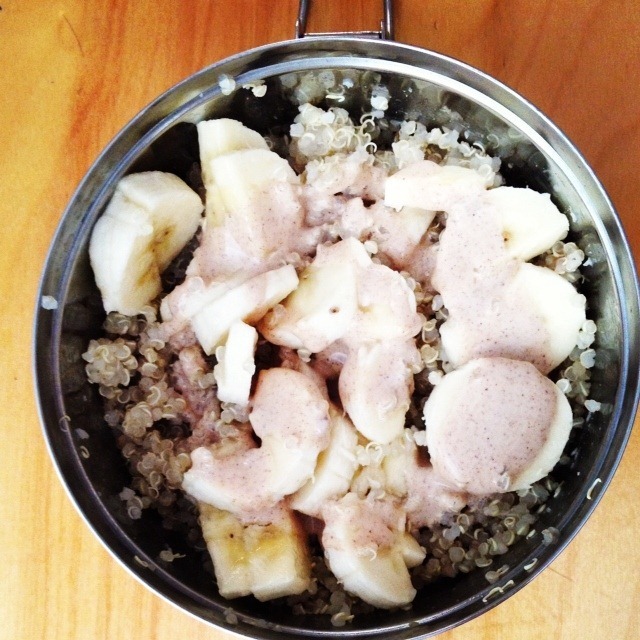 Quinoa + almond butter and almond milk + banana – can’t go wrong. (I am overly enthusiastic about each of those ingredients on their own and together is a match made in semi-raw heaven 🙂 And if it gets boring, you can always spice it up – literally! And if you need energy, you can do the maca-rena or add some cacao-làl-là love. By the way, have you tried Dastony almond butter? I’m obsessed. It’s incredible, and the consistency is especially wonderful for sauces like the one you made (you may not even need almond milk it’s so smooth!) Anyway, can’t wait to trade more meals on the go ideas – being a journalist is similar to being a student in that I am often far from a refrigerator and need to pack light (and also eat things that don’t involve chewing extremely loudly in a screening, like you in class I imagine!) Good luck with your classes and bon appétit, chérie! love this idea! chia puddings are great and all but sometimes i just cannot fathom another morning of the same old thing. almond butter sauce – mmm, with the dates blended in, bet that’s great! From the sound of your backpack, I am now firmly convinced that you are Mary Poppins’ twin sister. That breakfast looks awesome! I love quinoa for breakfast. And I’m going to try your beet smoothie on Sunday- it inspired me to finally buy and roast some beets myself. Not sure why I waited this long! Wow Gena you are done! Woo-hoo! Now you can breathe a little more. I’ll admit that I’m a little jealous of your impressive ability to have homemade meals so much of the time – between all of your classes and epically long (and amazing) blog posts – how do you have time to make hummus and sauces etc – and even go to the gym?? I’m so impressed. I hope I can (at least sort of) do this when I’m in Paris. Congratulations on finishing the physics! Physics was one of the hardest subjects I took and I stopped after high school so I’m very impressed 🙂 This bowl is also very impressive – what a great combination of flavours. how do all your eats and snacks sound so good?!? that looks so delicious! i love the bananas! yum! This is a great idea! I’ll be starting school soon and will need all the ideas for quick, portable breakfasts and lunches that I can get. Thanks! This looks like a divine lunch or breakfast, yum! This is fantastic. I love the idea of quinoa breakfast, but always thought I’d have to heat it with almond milk in the morning to make it a yummy more sweet dish. I too run around with the world on my back. Working as both a yoga teacher and writer in NYC means carrying 3 sets of clothes, a computer, water bottle, food, and sometimes a second pair of shoes, an umbrella and a raincoat. Too much! And I love smoothies to go, but tend to carry them in large mason jars. Also way too heavy. Chia pudding works for me, but the beauty of your quinoa idea is that it doesn’t sound like it needs to be eaten super cold, so I could nix the ice packs. I’m in the market for a new backpack…. Do you have a recommendation? 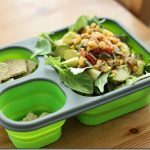 Hi Gena, your blog has really helped educate me on how to pack healthy, filling and delicious food when you’re on the go. I was wondering, how do you deal with packing food (and keeping it from spoiling) when you don’t have access to a fridge? Thanks! 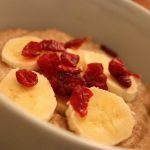 Looks like a great pre-workout meal…energy immediately available from the banana, protein from the quinoa and almond butter! 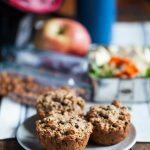 I’m a student too so I’m always looking for easy but delicious and filling to pack in my book bag (which sounds as stuffed as yours!). You’re breakfast sounds like a great option! School is starting soonly, and I was just thinking about how I was going to manage meals throughout the semester (as this is probably going to be my busiest yet! )… It’s like you read my mind, Gena! Your posts are always apropos my life! Congrats on your hard-earned break! Congrats on finishing up and having 2 weeks off!! I’m in school to become an elementary school teacher–I can’t even imagine how difficult Physics must be!–and classes kept me so busy (and my backpack so heavy) over the summer that light meals were necessary! I’ll definitely keep this in mind when my classes start back up in a week! Thank you! It’s amazing that you can fit all that in one backpack- seriously! 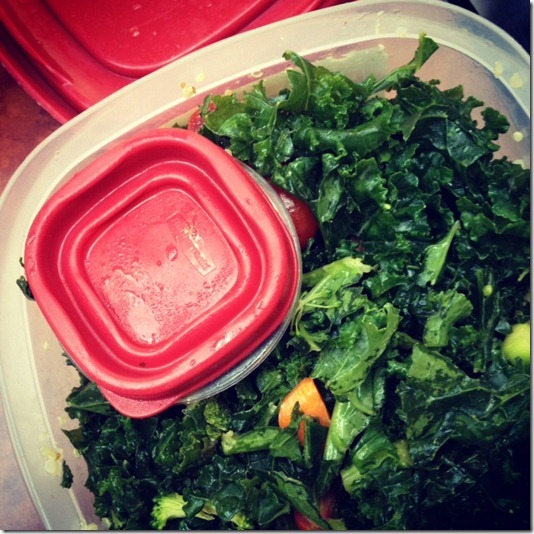 How do you keep your kale salad and hummus cool until you eat them though with no fridge? Really to get rid of physics II is a relief. By the way loved the recipe tried it in my breakfast very light. Thanks for sharing. Good job at finishing physics! Thanks for the healthy recipes. I have been reading your posts for about a month now and am wondering if you ever incorporate juicing as part of your raw diet. Love the almond butter sauce idea to put on the quinoa. I could drink that, I think. I enjoy hearing about what you’re eating for meals/snacks. It’s nice to see someone with such a healthy balance & it’s also inspirational for ideas of things to pack, even for someone in an office setting. Im so glad i found this site! My diet doesnt have to be boring! This could literally be a life-saving breakfast! My daughter is just starting refeeding, and I was looking for a hearty gluten-free vegan breakfast for tomorrow morning that I could make with ingredients I had on hand. We recently found your website (and have been inspired by the green healing stories!) so I came tonight looking for breakfast inspiration. For the sauce I used unsweetened vanilla coconut milk instead of almond milk; the vanilla flavor in the coconut milk was enough that I didn’t need to add vanilla extract. I felt like it needed a tad bit more sweetness (maybe because I was using raw almond butter?) so I added a third date. I tossed in a dash of cinnamon and it was perfect. I added a tablespoon of ground flax seed to the quinoa to boost the phosphorous content, with the hope of avoiding “refeeding syndrome.” I hope she loves it as much as I think she will! This may be a perfect summer breakfast, but I’m going to serve it warm – we’re in the DC area too, and it suddenly got chilly today!